I really wanted to see Elysium on the big screen but my wife refused to pay theater price for what we both knew was a propaganda film. Still, I really thought the visually artistic aspects and the performances of two A-list actors would redeem it. WROOONNNNG. Props to my wife for seeing through this one–we are still regretting our payout to Red Box. 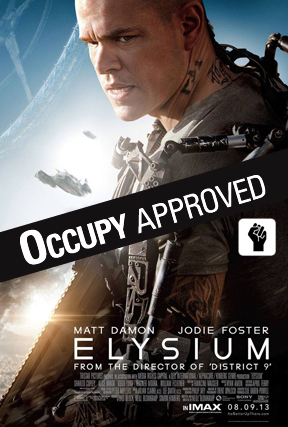 With a script cobbled together from assorted tweets by unemployed Occupy protestors (via iPhones made by evil capitalists of course), Elysium is a juvenile socialistic tome, and besides that is just a bad film. Jodie Foster plays a high ranking government official and one-percenter who lives on the idyllic Elysium space station while the rest of the ninety-nine percenters (represented with sweaty, self-righteous gusto by Matt Damon) suffer in the authoritarian, robot-policed squalor of third-world L.A. But Foster’s most distracting attribute is an extremely muddled accent. Is she French? Is she British? Is she German? Is she trying too hard? Yes. Matt Damon’s acting career and film selection have lately taken a back seat to his preachy left-wing worldview–and with predictable results (e.g. Promised Land, Green Zone, and Happy Feet Two). Amid a mine field of F-bombs, all of the clichéd bases are covered here: illegal (‘undocumented’) immigration, rich vs. poor, whites (who only live on Elysium) vs. all other races (who only live in squalor). But despite himself writer/director Neill Blomkamp gives a glimpse of the truth in self-defeating fashion. Who are the one-percenters in the film? The government officials and the business leaders they control. Perhaps if they had gotten out of the way and let a few capitalists employ Matt and his buddies (hello Detroit?) he wouldn’t have to get a bunch of drug dealers with Dremel tools to turn him into a human erector set. Look at the top of any Socialist/Communist government and you will find the residents of Elysium while the proles barter for black-market bread and drive 50s automobiles. Rent something with a deeper message like Pacific Rim.